Operations Management is concerned with the management of people and the customer processes and involves the study of the design, planning and control of these processes. John Bicheno is Reader in Operations Management at the University of Buckingham. Bryan B. R. Elliott is Senior Lecturer in Operations Management at Bolton Business School, Bolton Institute of Higher Education. 1. 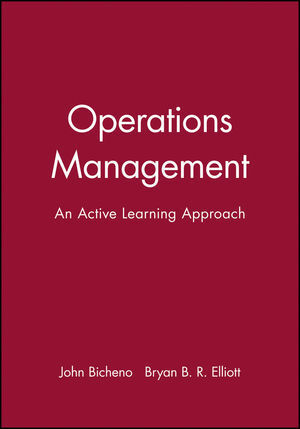 Introduction to Operations Management. 2. Product Planning & Positioning. 4. Managing Demand and Materials. 7. Productivity Methods and Measurements. Provides a user-friendly approach to operations management. Comprehensive coverage of the key issues in operations management, eg Business Process Re-engineering, Quality, JIT and Manufacturing Planning and Control. Includes a useful resource section including case studies, journal articles etc.